Information and Communication Technologies (ICTs) have raised to prominence on the global development agenda and continue to become fundamental for the political, social, and economic structures of today’s world. Most importantly, ICTs can facilitate effective governance structures by helping governments connect with citizens and civil society as long as their role is recognized within the post-2015 agenda. ICTs including the mobile phone and the Internet have changed the world and have open opportunities for enhancing development efforts to solve the health, agriculture, financial and education challenges that we face. ICTs, like all technologies, are tools and can be effective as long as users need and local context is taken into account. ICTs refer to technologies that provide access to information through telecommunications. ICTs focus primarily on technologies uses for communication, including the Internet, wireless networks, cell phone and other communication mediums. ICTs are the natural part of the implementation of the right to information, which is protected by Article 19 of the UN Declaration on Human Rights. New figures released by the International Telecommunications Union (ITU) indicate that, by end 2014, there will be almost 3 billion Internet users, two-thirds of them coming from the developing world (ITU, 2015). This corresponds to an Internet-user penetration of 40% globally, 78% in developed countries and 32% in developing countries. Furthermore, the ITU now estimates there are over 7 billion mobile phone subscriptions in the world, up from 738 million only 15 years prior (1). Internet penetration has increased even more quickly, from 6.5% to 43% of the global population over the same period. Nonetheless, many people are not going to be connected to the Internet or mobile will not have the necessary skills to take advantage of these new technologies. The rapid growth and reach of ICTs is evident and is something that we cannot simply ignore. Globally, 3.2 billion people are using the Internet, of which two billion live in developing countries. Increased access to information and knowledge, underpinned by universal literacy, is an essential pillar of sustainable development. 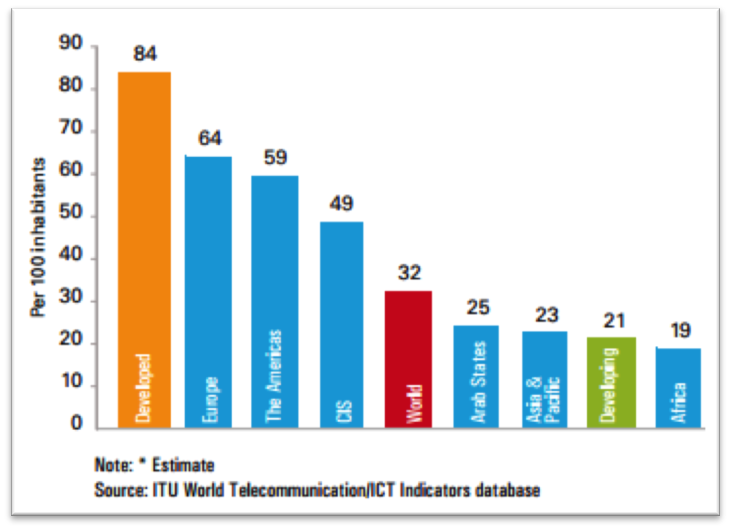 Can ICTs Affect Poverty and Improve Development? However, the decrease (over the past 15 years) in global income inequality masks the income inequality increases observed within individual countries. Within-country income inequality appears to be rising in many countries, in both the developed and developing world. The reason for this paradox is that, while ICT improves the standard of living for those who adopt it, those who do not adopt and use ICT do not improve their standard of living as fast or as much. These two examples display that we cannot just push for access for its own sake. Telecenters and other such initiatives have shown that access on its own did not change much for the communities targeted. More important is complimentary investments to nurture local capacity, as Kentaro Toyoma advocates (2). Because of these challenges, technology advocates need to get creative in order to provide meaningful connectivity that creates a better and more just world for those who are unconnected. How can ICTs drive development? The potential of ICTs lies in their capacities to instantly connect a vast number of individuals and organizations across geographical distances at very little cost. Improved ICT infrastructure can be used to expand communications, speed up the delivery of services and provide access to crucial information particularly in remote communities. Mexico’s federal government established “Compranet” for government procurement as part of its efforts to fight corruption by automating procurement procedures. By facilitating a process of bidding and reverse bidding on-line, it seeks to make government purchasing more efficient and transparent. The system allows the public to see what services and products the government is spending its resources on, and what companies are providing them with these services. There are more than 6000 public sector tenders logged daily, and more than 20 000 service-providing firms are regular users. (Source: UNESCO, 2009)(3). According to a World Bank, ICTs are becoming the largest distribution platform for providing public and private services to millions of people in rural and poor areas (4). Market information, financial services, education and health services had largely been unavailable in those areas in the past due to lack of connectivity of any kind. Now, ICT platforms are promoting new economic and social opportunities at all levels for the poor population. Respondents of the UN sponsored survey The World We Want indicated that effective governance should be considered a priority theme for the post-2015 agenda (5). The importance of effective governance (and the role of ICTs in facilitating this process) was echoed most recently by the UN Secretary General’s Data Revolution Group report A World that Counts (6) and the UN High Level Panel on the Post-2015 Agenda A New Global Partnership (7). Governments are increasingly looking towards ICTs as a tool to implement open government plans and improve e-government service delivery. For example, considerable progress has been made globally on establishing government agencies websites, with all countries having a government web presence in 2014 (8). Additional efforts have taken place to guarantee that documents such as laws are available online and other public services such as taxes, fines, licenses, and others. Furthermore, ICTs can facilitate the e-participation of citizens in rural areas, which are often disconnected from the decision-making processes of a centralized government (9). According to the World Health Organization (WHO), malaria caused an estimated 627,000 deaths among African children in 2012, while tuberculosis is one of the leading causes of death in Sub-Saharan Africa (10). The majority of these deaths are related to the lack of appropriate identification and treatment. Access to information is most crucial at the diagnosis stage. More than half of the children who die of malaria die within the first 48 hours. Fast and appropriate diagnosis and treatment of malaria is extremely important in reducing child mortality. Public Access Computers (PACs) with internet access have the potential of bridging the digital divide and making readily available information on malaria prevention and treatment. 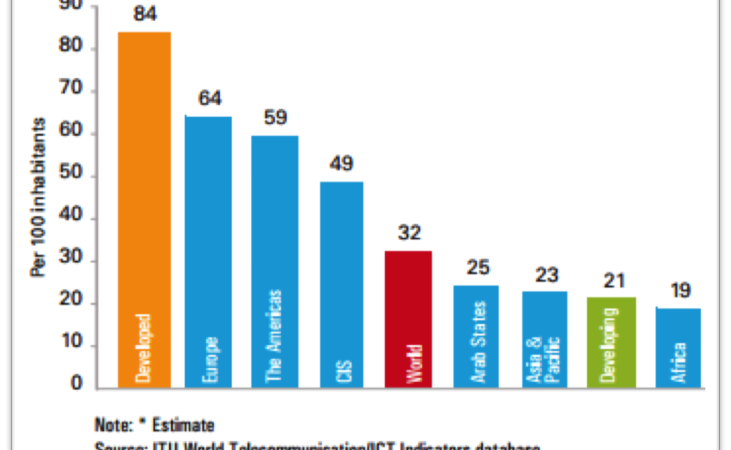 A recent survey completed by TASCHA in six countries found that public access to ICT plays a critical role in connecting people to information (11). Furthermore, a majority of the users surveyed came to public access venues to look for specific information; 82% of those that visited a public access point to seek health information reported achieving a positive result for their health. Telemedicine uses ICT networks to overcome geographical barriers to increase rural communitiesâ€™ access to health services, while decreasing costs and improving diagnosis (12). Through communication networks a local physician can send images or video to otherwise unavailable specialists to verify a diagnosis or facilitate the remote training of health workers. Countries are already reaping the benefits of telemedicine. In Romania, General Electric and IREX are hosting training programs for rural doctors at local libraries. The project is delivering remote training on clinical electrocardiograms (EKG) in partnership with the Bucharest Medical School. Similar projects and training schemes have been tailored to be adopted in the African context (13). Public Access to ICTs, especially the internet and other information networks is an essential link in the process to improve health outcomes in developing countries. Improved access to health information and telemedicine can help overcome challenges associated with lack of trained healthcare workers in rural areas and to raise awareness among vulnerable populations. When people have access to information and the ability to use it, survival rates for malaria and tuberculosis, especially among children, improve. Recognize the important role of local authorities, information intermediaries and infrastructure such as ICTs and an open Internet as a means of implementation. Promote the use of Universal Service Funds (USFs) to subsidize a variety of free and rural public access models, telecenters, schools, and libraries to guarantee equitable access to ICTs. Olimar Maisonet-Guzman is a Policy Coordinator for IREXâ€™s Center for Collaborative Technologies where she explores the use of emerging technologies and new media in international development and citizen engagement. Maisonet-Guzman is a 2009 Harry S. Truman Scholar and a 2011 David L. Boren Fellow. During her Master’s program, she spent a year in Brazil conducting environmental conflict policy research at the University of Sao Paulo’s Climate and Water Resources Research Group. Maisonet-Guzman has extensive policy experience, having previously worked at the U.S. State Department as a Staff Assistant at the Bureau of Oceans, Environment and Science, and as a policy coordinator for the United Nations Rio+20 and the post-2015 negotiations processes. She has participated in international conferences including Rio+20, UN Commission for Sustainable Development, World Water Week, and the Clinton Global Initiative as a speaker and expert on development issues.